May is Brain Cancer Awareness Month. Show your support for a friend or loved one battling with brain cancer by wearing our eye-catching, Cure Brain Cancer T-Shirt. Brain Cancer Apparel is ideal for Brain Cancer Advocacy Events, Brain Cancer Awareness Walks or events that help promote Brain Cancer Awareness. Wear Grey today to show your support and help put an end to brain cancer once and for all. Our Personalized Brain Cancer Awareness T-Shirt is available on our premium 100% cotton T-Shirts, machine washable in youth sizes XS-L and adult sizes S-3XL. Includes FREE Personalization! 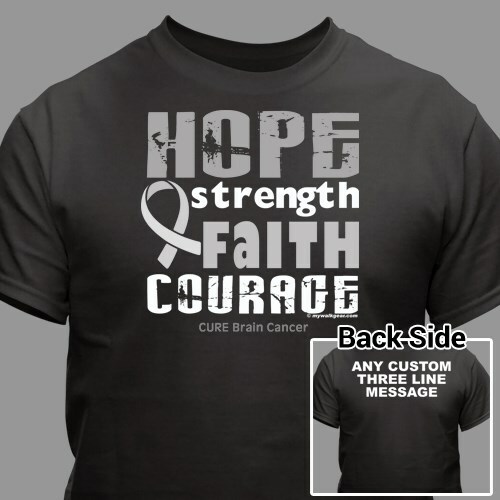 Personalized your Brain Cancer Awareness Shirt with any three line custom message on the back. Additional Info MyWalkGear.com is dedicated to promoting Awareness for Brain Cancer, supporting those battling Brain Cancer, honoring those taken and encouraging others to get involved in the fight for a cure with unique Brain Cancer Awareness Apparel and Walk Gear. Help us help those who need us the most with this inspiring Awareness t-Shirt or our Find A Cure Brain Cancer Awareness T-Shirt. You will feel great knowing every purchase made MyWalkGear.com will donate a portion of the proceeds to end this disease once and for all.